The word Birhor finds its meaning in Mundari Language where it can be seen as a compound of two meaningful words –'Bir' meaning 'forest' and 'Hor' meaning 'the man'. Therefore, Birhor means the men of forest. The Birhors belong to the Proto-Australoid stock. By appearance they are dark-skinned, short-statured, long-headed, wavy-haired and with a broad-nose. Birhor is one of the eight primitive tribes inhabiting in the districts of Hazaribagh, Giridih, Ranchi, Lohardaga, Palamu, Garhwa, Dhanbad, and East-West Singhbhum in Jharkhand. According to 2001 Census, Birhor population in Jharkhand is 7514. The Birhor tribe in Jharkhand is divided into two sub-tribes, Jaghis and Uthlu Birhor. These two sub-tribes live a distinct pattern of socio-economic lifestyle. In fact, the Jaghis are nomads who keep shifting from one place to the across forests of Jharkhand. They make their living by hunting, wood cutting and rope weaving. The Uthlu Birhor is comparatively well settled group; they own agriculture land and grow various types of crops. These tribes practice shifting cultivation i.e. when the food supply of a particular forest is exhausted, they head towards another forest. They are also the domiciles of some districts in Odissa and Chattisgarh, however, the majority of the population is found in Jharkhand. The Birhors do not follow any religion in its strict sense. However, they have developed some indigenous worshiping patterns in which a mountain (Buru) is treated as god (Bonga). A yearly congregational worship is performed in which black feathered hens are slaughtered under a Sal tree and hymns are sung to appease Buru, the Mountain god. In their indigenous culture the rituals like Birth ceremonies, Marriages and Death ceremonies are unique. They bury their dead. However, some Uthlu Birhors are now Christians and Hindus as well. Interestingly, the Uthlu Birhors are the only Hindus in India who bury their dead. But the majority of Jaghis are still following their own indigenous, ethnic worship patterns. Birhor belongs to Austro Asiatic language family. It does not have a script and is performed orally. Birhor is listed among the endangered languages in India. It is quite close to Mundari and Santali in its vocabulary. 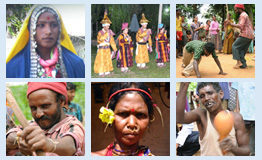 It is difficult to distinguish Birhor from other neighbouring tribal languages such as Santhali, Mundari or Ho languages. Birhor displays an SOV word order. There is a dialectal variation found among Jaghi and Uthlu Birhor. However, diglossic variations are not obvious. Some of the significant work in Birhor includes The Birhor: A little known jungle tribe of Chota Nagpur by S. C Roy (1925) and The Birhor, A. K Adhikary (1999). It has been an attempt to complete the documentation of the language. Presently, making of digital tri-lingual dictionary, A Grammar of the language and Eco-semantic, Ethno-linguistic analysis of the language is in progress.